If politics is a popularity contest, Donald Trump is right up there with the former head of the Ku Klux Klan. The Republican presidential hopeful is the least liked candidate for president since ex-Klansman David Duke took a crack at the Oval Office, a new ABC News/Washington Postpoll found. 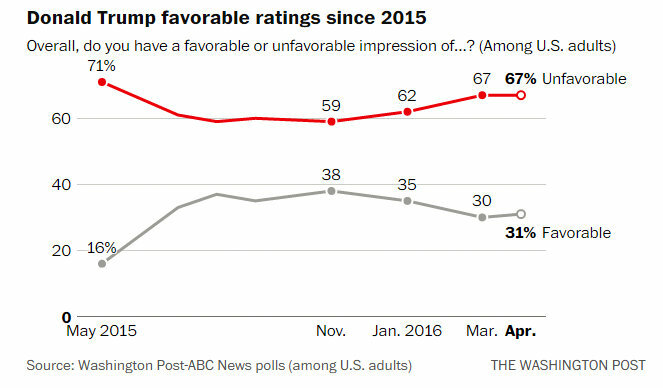 GOP frontrunner Trump is seen unfavorably by a stunning 67% of Americans — about the same as last month, the poll, released Thursday, reported. 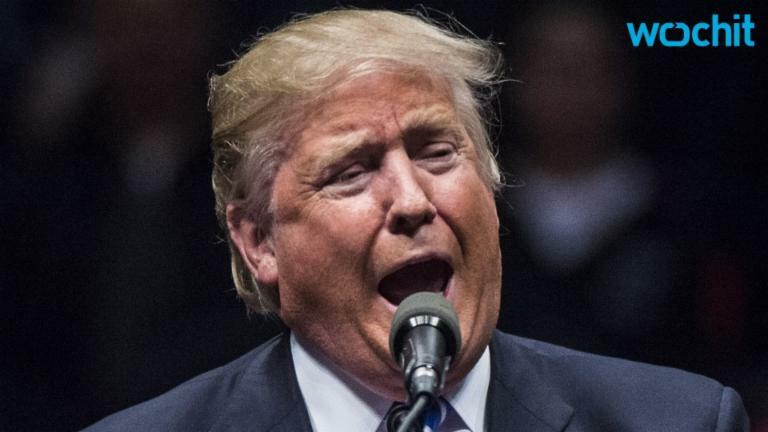 Amazingly, the more than two-thirds unfavorable figure isn't even a record for Trump: 71% of the country viewed him negatively in a similar poll conducted about a year ago, ABC News stated. Duke, the former KKK grand wizard and ex-member of the Louisiana legislature, "was rated unfavorably by 69% of Americans in an ABC/Post poll in February 1992; he went on to win fewer than 120,000 votes, and no delegates in his bid for that year's GOP presidential nomination," ABC News reported. Former KKK Grand Wizard and presidential candidate David Duke. By comparison, Trump, who received — and repudiated — Duke's support in this election, "has won more than 8 million votes to date." 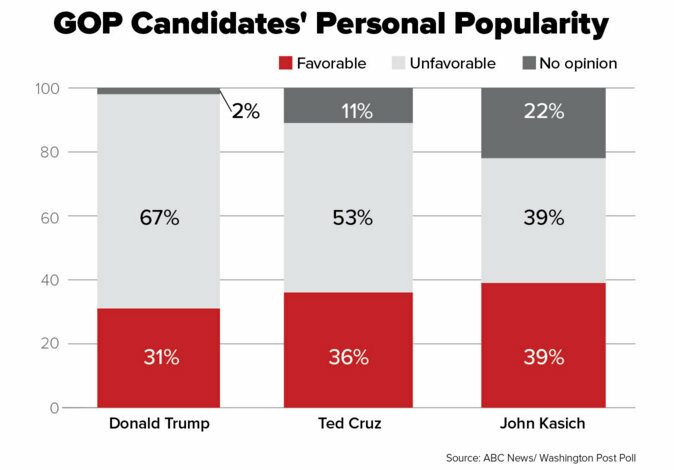 Cruz cut in popularity: Meanwhile,Trump's closest rival, Ted Cruz, saw a spike in his negative ratings, and underdog John Kasich broke even. Cruz's "53% negative rating among all adults is up 10 points since January to a high in more than a year of polling. Just 36% see him positively," the survey found. "Kasich's 39-39% favorable-unfavorable rating makes him the only GOP candidate not under water," although many Americans have yet to form any opinion of the Ohio governor. The negative views of the candidates may reflect a building "hyperpartisan climate" that has bred "previously unseen levels of ideological polarization among primary voters this year," ABC News reported. Within the GOP alone, versus the public at large, the numbers tell a somewhat different story, the report said: "Cruz has a +20-point net positive score; Trump's is +14 and Kasich's +7." — He stands at -51% in popularity among men, versus -22% among men. — His negatives hit -84% among black Americans and -66% among Latinos, versus -20% among whites. — And in a particularly worrisome sign for his prospects in a general election fight, the Post pointed out, "Two-thirds of political independents have an unfavorable view of Trump, as do 74% of Americans under age 40." It's not quite what Trump might call a "lovefest" across the aisle, either. Democratic frontrunner Hillary Clinton's popularity wasn't tested in the current survey, but she "was seen unfavorably by 52% in an ABC/Post poll last month, 2 percentage points from her worst, 54% unfavorable in April 2008," the ABC News report noted, adding that no previous Democratic candidate had fared worse in the ABC/Post poll during an election year. The upshot: Barring a sea change in sentiment, Americans may go to the polls in November to choose between a Republican and a Democratic presidential nominee most people just can't stand.